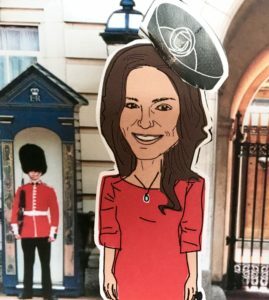 Pocket Royals: Meet Princess Kate! Catherine (Kate) Middleton is formally known as the Duchess of Cambridge and is the wife of Prince William, second in line to the British crown. Born in 1982, Kate’s often seen as a commoner because she had no formal title upon her engagement to William, but Kate’s family has ties to the British aristocracy. Her family lived in Jordan for a short time during Kate’s youth, and Kate was enrolled in private schools in Berkshire upon their return to the UK. She went on to study art history at the University of St. Andrew’s in Scotland, where she met Prince William. Kate and William began dating in 2003, although their relationship was unconfirmed. She and William dealt with media harassment all through their courtship and Kate sought out legal action against media officials. As time went on, Kate attended official royal events like military parades and weddings. The couple split up for a brief period of time around 2007, but eventually reconciled and became engaged in 2010. William gave Kate the engagement ring that previously belonged to his mother, Princess Diana. The two were married in April of 2011 while an estimated 300 million people around the world watched on their televisions. After the wedding parliament implemented changes that adopted absolute primogeniture, ensuring that Kate and William’s first child, regardless of their gender, would be eligible to take the throne. Kate and William have two children: George, born in 2013, and Charlotte, born in 2015. Kate’s pregnancies and the births of the royal children were much scrutinized by the press. However, Kate remains a very popular figure, both as part of the royal family and as a worldwide fashion icon. Her duties include most accompanying or representing Prince William on tours and visits made in name of the Crown, such as traditional Commonwealth tours. Her favorite philanthropic organizations include national museums and children’s health and medical care. The royal couple even set up a gift fund for their wedding, asking well-wishers to donate to charities rather than send gifts. Get your own printable Princess Kate here. Playwright Mike Bartlett fictionalized the royal family for his “future history play” King Charles III. Played by Allison Jean White, Bartlett’s Kate is a modern woman with her own vision of the monarch’s role. A caring wife who wants the best for her family and nation, Bartlett’s Kate walks the line between schemer and a strong woman among weaker men. Read more on Bartlett’s treatment of Kate here.